Race fans around the world will join with the Indianapolis Motor Speedway in May 2019 in a variety of activities to celebrate the 50th anniversary of Mario Andretti’s Indianapolis 500 victory, including a featured exhibit within the Speedway’s museum and a commemorative logo that was unveiled by Andretti on Jan. 9 in Indianapolis. 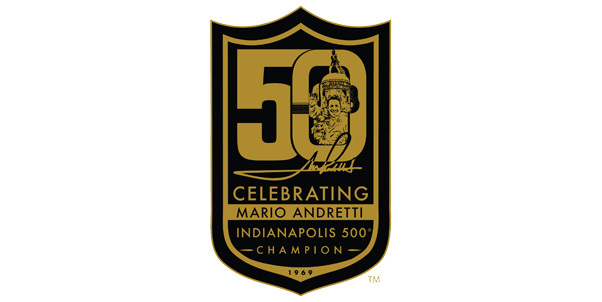 •A 50th anniversary logo was designed to celebrate Andretti’s historic victory at Indianapolis. It features Andretti giving his famous wave next to the Borg-Warner Trophy moments after winning the 500-Mile Race. The logo was illustrated with the Speedway in mind, with the zero (in the 50) representing the oval of the track and the historic Yard of Bricks start-finish line. The base of the 50 is adorned with Mario’s signature, with the badge honoring the Andretti family crest. •Andretti will be featured on the IMS Bronze Badges. •The logo also will be featured on the cover of the 2019 Indianapolis 500 Official Program, with a special artist’s rendering of his unforgettable victory. •Memorabilia and celebratory officially licensed Mario Andretti and IMS merchandise, including apparel, headwear, replicas, jewelry, wall décor, collectibles and other special items, will be available for purchase. Andretti won the 53rd Indianapolis 500 on May 30, 1969, driving the No. 2 STP Oil Treatment Hawk III-Ford fielded by famed team owner Andy Granatelli. The victory was one of the most noteworthy achievements of Andretti’s incomparable career, which also included a Formula One World Championship, four IndyCar championships, a Daytona 500 victory and victories in the Rolex 24 At Daytona and 12 Hours of Sebring. More details about the Andretti 50th anniversary celebration, including the availability of commemorative merchandise, will be available soon. The 103rd Indianapolis 500 is scheduled for Sunday, May 26 at IMS. The Month of May at IMS will open with the INDYCAR Grand Prix on Saturday, May 11.